The DC-9 touched down heavily on runway 09L. The main gear collapsed and the tail section separated. The aircraft caught fire. 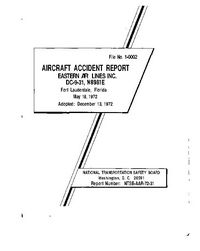 PROBABLE CAUSE: "The decision of the pilot to initiate and continue an instrument approach under weather conditions which precluded adequate visual reference and the faulty techniques used by the pilot during the landing phase of that approach. The Safety Board also finds that the flight crew's non-adherence to prescribed operational practices and procedures compromised the safe operation of the flight." Distance from Miami International Airport, FL to Fort Lauderdale International Airport, FL as the crow flies is 34 km (21 miles).